I have worked with Sincere Escrow for quite sometime, and find them to be very professional, courteous, and very good at handling my clients. They will always go the extra mile. I encourage you to try their services, I'm sure you will be very pleased. Industry experience has taught us that Real Estate Professionals require astute escrow specialists with proven knowledge and expertise for their transactions. Sincere Escrow works with you to develop escrow solutions that are practical, logical, and creative, while remaining solidly grounded within regulatory standards. Our aim is to exceed the expectations of your Buyers and Sellers. Sincere Escrow has a reputation as a company that can be trusted and relied upon. Seeking us out, our customers view Sincere Escrow as offering a results-oriented approach to the residential and the commercial property community. We handle all forms of escrow, including developer site acquisitions, business opportunity escrows, and stock transfers for all clients. The team at Sincere has an intricate understanding of figures, interpretations, inclusions, contracts, financial, civic, state, city, and county codes that permeate escrow transactions. 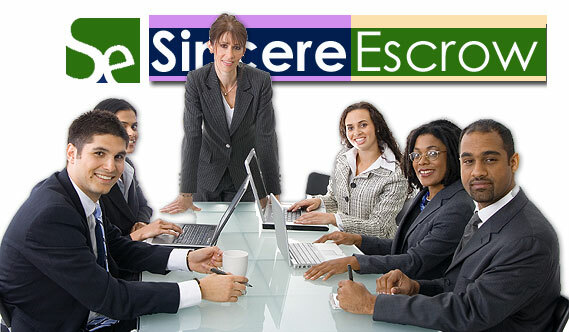 As your business partner, Sincere Escrow will work with you to create a strong and lasting business relationship. We are confident that you will be so pleased with our escrow services that you will work with us again and again.